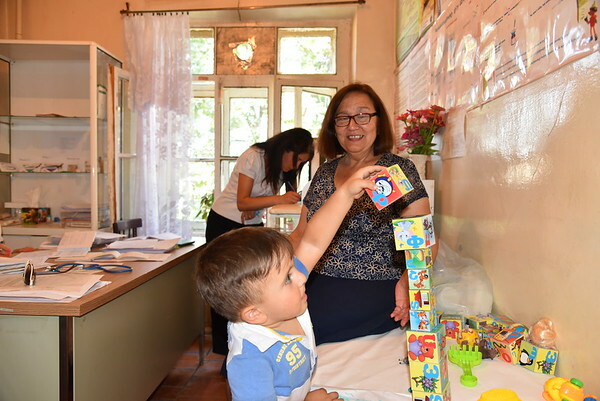 Doctor Olga Nazanyan holds a photo up in front of two-year-old Ono*. “Hey, Ono. What’s this?” she says. “It’s a bit,” he says, shortening the word for rabbit. Dr. Nazanyan’s questions are part of a new study initiated by FAR’s healthcare team, which focuses on assessing the cognitive and mental development of toddlers (nine to 36 months old), and the ability to shape a child’s perceptual, mental, cognitive, and speech abilities. Using the “Ages and Stages” survey, which we developed with the help of local experts, the study is currently being conducted in the region of Berd and its surrounding 16 communities where FAR has been implementing the Breaking the Cycle of Poverty Program (BCPP) since 2014. The assessment follows several other BCPP initiatives to help children, like the Childhood Malnutrition Program. Dr. Nazanyan, 60, serves the two border communities of Aygedzor and Chinari. She works with about five kids per day and uses different techniques and props to ask her questions, including puzzles, pictures, toys, balls, colorful images, notebooks, and pens to understand where the kids stand in terms of cognitive and mental development. Before working with the kids, the experienced doctor takes off her white coat so as not to scare her little “patients.” Then she asks questions and takes notes. “Cognitive and mental development is important in toddlerhood. During this stage, infants and toddlers learn things by doing—by touching, grasping, looking, and hearing. Their grasp of language is also increasing,” says Nazanyan, who has already worked with 53 toddlers from Chinari who have all shown good results. “Chinari is one of the rural communities in the Berd Region which faces a number of challenges such as poverty, low access to services, high unemployment rate, security issues, etc. However, children adapt to new things with an ease and grasp everything quickly,” she says. FAR will use the results of this assessment to design its next project geared toward children’s mental health and cognitive development. More details will be available in the future. *The child’s name has been changed here to “Ono” to protect his identity.